The launch date for the first figure in Mattel's online only, subscription based DC Universe series 'Club Infinite Earths' is finally set in stone... or a reasonable facsimile. Starting in May (of this year), the line will kick off with the original scarlet speedster- the classic Jay Garrick version of the Flash. 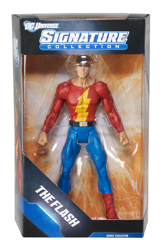 In a mass email to subscribers, the toy giant released not only the official word on the Golden Age Flash, but also the full schedule (barring disaster of course) for the remaining Club Infinite Earths figures. One thing of note: your club order will not be eligible for combined shipping until June, which is the first “renewal” month. You may recall that the first month a subscription order ships, it has to ship separately, then beginning with the second month it will be combined with your other subscriptions. Even though he won’t arrive until May, our Golden Age The Flash figure will certainly be worth waiting for! The original scarlet speedster, Jay Garrick, will come with his vac-metalized signature helmet and, like all figures in the line, will feature great details and full articulation. We’ll post updates at MattyCollector.com as we get closer and have more information. For now, you can look forward to an amazing year packed with long-awaited true collector characters! Thank you for being a loyal customer - we appreciate your business. Matty has made a few detractors over the last few months with questionable quality control and delays on scheduling for their Masters of the Universe Classics series (among others). In my opinion though, the company does a pretty solid job of getting toys that collectors would never otherwise see at retail into their hands. Slip-ups or no, Matty should be applauded for actually doing something that few other companies do- giving the fans what they want.